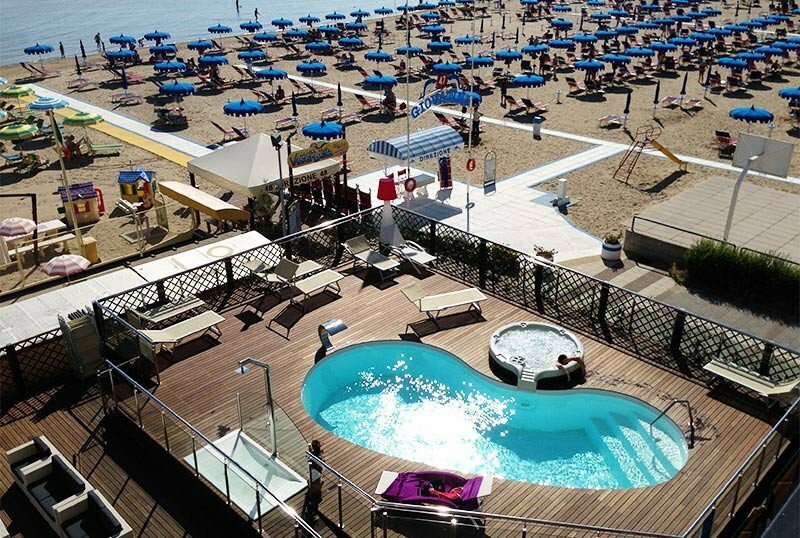 Hotel Baia is a 3 star hotel in Viserbella di Rimini, directly managed by the sea. It has outdoor parking, WI-FI connection, swimming pool, Jacuzzi, solarium area and outdoor relaxation area. Admits pets. The hotel is located directly on the beach, on the seafront of Viserbella. It enjoys a panoramic view and is located in a quiet area near the bus stops: the number 4 bus, which connects Viserbella to the port and the center of Rimini, runs every 15 minutes. The hotel is also close to The Rimini Expo Centre and the Italia in Miniatura theme park, both just a 10-minute drive away. All rooms are equipped with air conditioning, satellite TV and digital terrestrial, safe, telephone, WI-FI, private bathroom with hairdryer. SUPERIOR FRONT SEA: balcony with frontal sea view, recently renovated with shower in the bathroom, mini fridge, LED TV. COMFORT FRONT SEA: balcony with frontal sea view. Classic furniture and same additional services as the Superior Sea Front, without a shower. SUPERIOR: refurbished room with all the Superior Sea Front services. COMFORT: spacious and modernly furnished room with side sea view. It enjoys all the services of the seafront Comfort, except the use of the fridge, available only on request. CLASSIC: modern room with use of the fridge, air conditioning on request and all the basic services. Garden, outdoor relaxation area with swimming pool, Jacuzzi, solarium, beach umbrella and tables. Inside, air-conditioned restaurant, American bar, satellite TV room with large screen and newspapers in consultation, lift, free use of bicycles. PARKING: discovered and available free of charge for everyone. CONVENTIONS: beach, amusement parks, organized excursions and shuttle service. PETS: animals of all sizes are allowed. BREAKFAST: it is served buffet style with sweet or savory choices: bread, homemade cakes, croissants, biscuits, biscuits, jams, yogurt, cereals, eggs, bacon, cheese, wurstel, fruit juices, freshly prepared centrifuges, coffee , cappuccino, chocolate, tea. LUNCH AND DINNER: 3-choice menu with dishes based on meat, fish and vegetarian, buffet of appetizers, vegetables, rice salads, fruit and desserts (single portions, cakes, mousse, ice cream, sorbet). Homemade sweets. VARIATIONS: vegetarian cuisine on request, for celiac. In hotel: indoor playground area, strollers, baby pool, live entertainment with baby and mini club, afternoon snack, pediatric counseling. At meals: high chairs at the table, homogenized, kitchenette for mothers. The pool is located in the new relaxation area that overlooks the beach. Surrounded by a sunbathing area with deck chairs and sun loungers, the pool is 125 cm deep and features a 6-seater hot tub and a cervical massage blade. The structure has an agreement with the Marina di Rivabella beach (n.47 n.48 and n.49), a facility equipped with a gym, sports fields, WI-FI areas, a children's playground area and live entertainment, and a wheelchair for disabled people. July special: sea, relaxation and fun! With the special July del Baia, 3-star Hotel Rimini near the sea, you can stay in Riviera at truly exclusive rates. Do not miss this opportunity, availability is limited. Seize our offer for Easter in Rimini in a 3-star hotel facing the sea. Take advantage of the Hotel + Park package, designed for you and your family. from € 25.00 per person per day.